Claim for your accident at work. Your employer is required to take such steps as are reasonably practicable to ensure your safety and well-being while you are working for them. This obligation applies even if you are sent off site or are required to drive for a living, and not just those who work in one place all the time. Obviously your employer cannot be responsible for all things that happen; if someone crashes into you then it is fault of the other driver and not your employer. If, however, the car’s brakes fail then that may well be down to your employer. Your employer should ensure that the premises and the equipment that you are required to use are safe and free from hazard. This means taking steps to ensure that all walkways are clear and safe to walk and there are no obvious or hidden dangers. The definition of equipment is not just the plant or tools that you use to do your job but ancillary pieces of equipment such as the chair you sit on or the kettle that boils the water for your cup of tea – anything that is used as part of the overall process of you being at work is regarded as equipment. Included within the definition of equipment is person protective equipment (PPE) i.e. equipment and kit you need to carry out your job in a safe manner. This can include the provision of oil resistant footwear; safety glasses and gloves etc. If your employer fails to provide you with appropriate PPE then they are in breach of the regulations that govern this requirement and chances are they will be liable for your injuries and losses. As well as plant, equipment and kit your employer can, in certain circumstances, be liable for the negligent actions of your colleagues and workmates. Again, this depends on the circumstances. If, for example, a colleague for no apparent reason walks over to you and just punches you then it is unlikely that your employer is responsible. However if such a colleague inadvertently drops a metal bar on your hand then you would stand a good chance of having a successful claim against your employer. 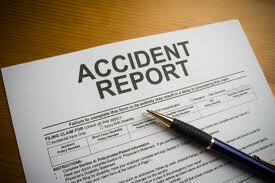 Make sure that any accident you have is recorded in the accident book; if one is not available then make sure that full details of the incident; injuries, causes, witnesses etc. are noted and signed by a member of the management, or at the very least your department manager or foreman, depending on your work environment.